She reached out to me, exciting to have company, excited that somebody had finally taken notice again. In the past 18 years, precious few had. Once home in the hearts of thousands, the great ship lay bare now, a proud but neglected shell of her former self. Yet here she was; and here I was in a naval graveyard on the Pacific Coast. Great ships have a soul, and the former USS Independence was proud again…if only for a few fleeting moments. 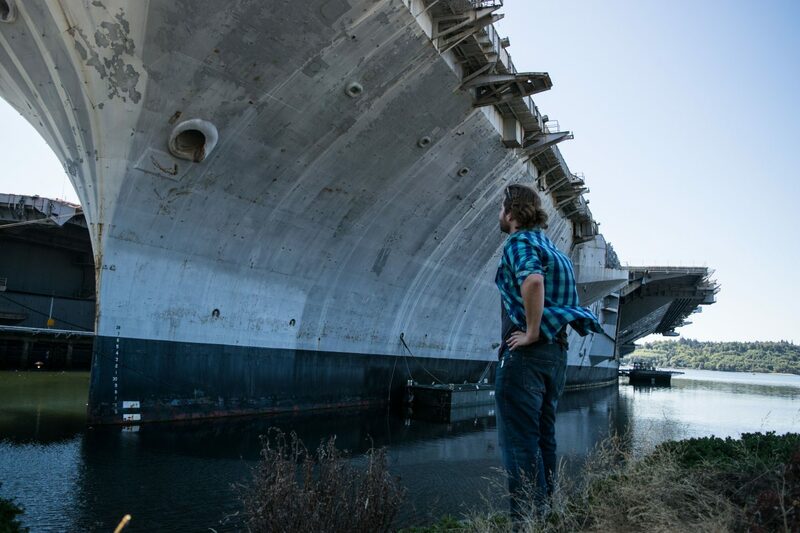 There are only two decommissioned aircraft carriers at the Bremerton, Washington shipyard now—Kitty Hawk, whose stern clearly still displays her name, and Independence, who’s been picked over and scavenged for every last salvageable part in the nearly two decades since she was decommissioned. From ground level, she’s unrecognizable. But a short hike up a nearby hill and into a vacant lot put me at eye-level with the bridge, and from there, she couldn’t be mistaken. 20 years ago to the day, my older brother was on this ship. It’s likely he was somewhere in the Pacific Ocean, many thousands of miles away from the Puget Sound inlet the Indy now calls home. He sweated and strained and crawled through the old carrier’s boiler rooms for years, sneaking to the flight deck to catch a glimpse of the action when he could. In the belly of the beast, he traveled the world from Hawaii to Australia to Hong Kong, Japan and the Middle East. The thought wasn’t lost on me, not as I left the Seattle area for the start of Leg Two of this Souled Outside journey. This leg takes me south down the 101 through the remainder of Washington State, Oregon and eventually California. 5,000 miles on U.S. highways seems like a lot, but in the grand scheme of things, it’s really not. The oceans I cross are on ferries; the seas are never too rough. But maybe the spirit of adventure is the same. Maybe that genetic driving force—whatever it was that possessed my older brother (and grandfather before him) to enlist and see the world by hook or by crook is propelling me forward too. But it’s not hard to say that the first day of Leg Two has been one for the ages. As I rest under a red, nylon canopy just 15 feet from a sandy, Pacific beach, I can hear the waves roll in. Many miles in the rearview, the Independence is hearing them too. Rest easy, Independence. Know that I will. Know that, like you, I will go far.